Although it has taken a long time, childcare workers, nursing staff and aged care workers are finally gaining the recognition they deserve. As health and safety regulations become standard workplace protocol all around Australia, the value attributed to highly-trained care industry workers has risen, along with the qualifications required to perform all care work functions at adequate levels. Provide an Emergency First Aid Response in an Education & Care Setting (HLTAID004) has become an extremely important first aid qualification in demand, with Real Response course graduates among the most proficient in Melbourne and the rest of Australia. What emergency first aid training is provided? Real Response courses are adapted to provide appropriate emergency response training for all workplace and community settings. Our course delivery includes simulation based training, or ‘learning by doing’ allowing course participants to practice their life saving skills even while training. Simulation based training has been used with great success to train paramedics and other emergency response personnel for decades, and the method didn’t go unnoticed by Real Response founders. Will I receive workplace approved qualifications? All Real Response qualifications result in accreditation that is accepted by government and industry experts around Australia. In fact, Real Response was established in 2014 to bridge the divide between attainments and genuine life saving capabilities. First aid knowledge and skills are easily learnt by almost anyone, and with the addition of simulation based first aid training, the life saving skills also become life skills that are deeply embedded and ready to be called upon whenever required. There is a whole lot more to be discovered during an enlivening day under the tutelage of Real Response course instructors who are ready to help you maximise your first aid response capability. Are real life scenarios necessary to learn first aid? Real Response has become a Melbourne icon, in part due to our desire to reach out to all people in the city and suburbs. Our simulations experts enjoy the opportunity for on-site training at a location of your choice. 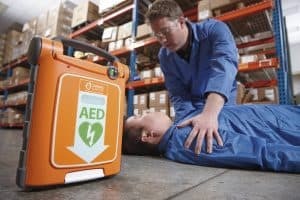 Advantages include workplace-specific first aid training, localised risk management, creation of dedicated first aid facilities, proper equipment storage, and team bonding in the workplace. We also host ‘public courses’ and training at our Real Response headquarters located at 1/3 Wellington St, St Kilda 3182. Provide an Emergency First Aid Response in an Education & Care Setting (HLTAID004) is a standout course for all healthcare and childcare workers, and our course graduates are among the most outstanding first aiders in Melbourne.